ODESSA (April 29, 2016) – Goldman Sachs, a leading global investment banking, securities and investment management firm based in New York, acting in a collaborative partnership with the American Association of Community Colleges, announced earlier this week that nine community colleges throughout the nation were selected to receive grants totaling $1 million from the Goldman Sachs Gives Community College Fund. 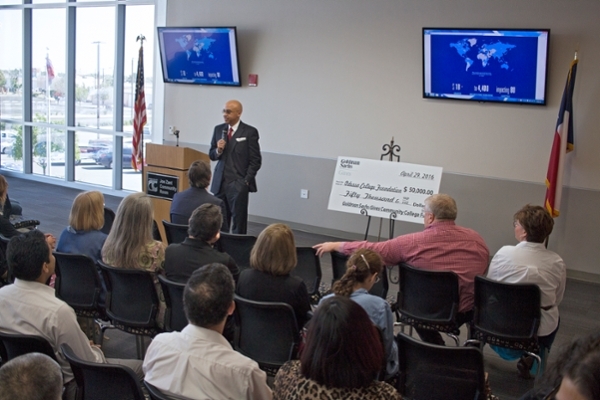 The grant of $50,000 from the Goldman Sachs Gives Community College Fund was also matched 1:1 by the ECISD Education Foundation, for a total of $100,000 of funding in support of need-based financial aid at OC. The community colleges selected all have a proven track record of successfully building partnerships within their communities, outstanding leadership, and solid commitments to providing students from all backgrounds and socioeconomic levels equal access to educational opportunities via dynamic and innovative financial aid programs. Created in 2010 both to support and enhance community college funding of need-based financial aid and to build upon the firm’s larger commitment to supporting and advancing community colleges across the United States, the Goldman Sachs Gives Community College Fund has helped provide financial aid and scholarships at more than 200 colleges and universities around the world, making Goldman Sachs one of the largest private donors to financial aid for higher education.